The past few days I haven't been updating the blog, because I was trying to change my sleeping schedule and as a general rule I was feeling tired. Yesterday I managed to sleep a bit during the day and I finally recovered the forces necessary to write. The reason why I changed my schedule is the WCOOP main event, which starts Sunday at 22h. The day before yesterday I was awake until 9 am and I slept all day long, with a pause for a late lunch. An advantage of doing this was being able to see the sun rising in the horizon. It's something amazing that I regret not being able to do everyday, since it's at 7 am. I was slightly mistaken on my prevision about the points, I only have 118k VPPs this month. Playing some MTTs had a negative impact on the number of points I gained, because I spent time on those and was feeling more tired. However, I am satisfied with the results of the tournaments. 2 years ago I had $200 and a force of will far above the average. 1 year ago I had one more digit in my bankroll and goals that were very ambicious for the national reality at that point. Today I have less force of will than 2 years ago, less goals than a year ago, but I continue to be ambicious and I have a quality of life that I didn't have before. In reality, the goal I have today is to optimize my hourly rate, so as to be able to have more free time for the rest. To resume, I have been playing less hours, but every hour has more value each time! I never had an ITM finish in a live tournament and in 3 tournaments I managed to make 2 ITMs and get $51k! As during the past years, this year also I managed to increase my bankroll by 1 digit, but I don't know if I'll make it again next year. It's just something I'm curious about, but not one of my goals. During the past week I cut down on MTTs a bit. I reached the conclusion that they are EV- for me, because I was playing them without really feeling like it. It doesn't make any sense waking up at 10 in the morning, playing 6-8 hours of sit-n-gos to play an mtt after that can potentially last 10 hours. On a subconscious level I want to go to sleep and that's bad. I will continue to play mtts of course. Today I'm playing the WCOOP-26* ($5200), but I will play it with a lot of will and with a clear mind. Follow me through my facebook page and of course at PokerStars! *The SuperNova Elites get a free entrance to the WCOOP main event. I have played for some hours, rested a bit and I made an effort so that what I'm doing is really what I want to be doing. Like, if after playing 1 hour, I feel like taking a break, I stop opening tables and I go rest. After resting, I go back to playing with a clear mind and more will. This profession has certain disadvantages, such as never having a month of vacation, but it also has the advantage of controlling one's schedule and working pace. Of course, if I don't work I don't make anything, which is why I need to balance everything. I slightly changed my way of playing the last days, deviating a bit from the ICM. These were small changes in the philosophy of the game that I think will increase my expected value. The funny part was when I realized what I was doing wrong. On one hand I was thinking "how didn't I realize this before?" and on the other hand it was this "Eureka"* sensation of discovering something. Anyway... I think that my ROI will go up a bit, but let's wait and see. The important thing is when a person is constantly evolving, because otherwise they will be left behind. "Try to play these WCOOP tournaments, they are great. If you are not able to pay the entry fee, check out the satellites running all day long, there is great value there." "Hi André: I come to share with you a weekend of success because I consider that part of it I owe to your example. I won two entries for the WCOOP 22 and 38 at the satellites 5,5 and 16$ with rebuys (of $530 each)..."
Vitor, with an investment that I guess must have been less than $100, managed to get T$1060 at the satellites at PokerStars! He unregistered, since it wouldn't be good bankroll management to play tournaments that have so high buy-ins, and I imagine he will play in spring during the SCOOP that has lower buy-ins. As you can see, I was right about what I said! If you can't play the events, play the satellites cause there is a lot of value to get out of them! My sister entered the faculty of Lisbon and until she finds a place closer to university, she will be staying with me. Therefore, yesterday I had company for dinner! Yesterday was a typical Sunday, very tiring and full of work. When it was time to go to bed, I had too many things on my mind so I couldn't enter the world of dreams just yet. I decided to do what most people do when they can't sleep... I opened a cash game table (8-game) with a few cents at PokerStars and I played for nearly one hour, getting a profit of $5. Then, at around 2 am I managed to sleep. Today I woke up at 9:30, which is quite unusual, taking into account that I slept at 2. I looked at the gym schedule and I saw that there was a pilates class in the morning and decided to go. I went to the gym on foot, which is close to a 35 minutes walk, and after changing I went where the class took place. There were two women at the door, who were waiting outside due to the heat in the classroom, and two younger girls, all waiting for the teacher. The teacher arrived and the class started. Just so that you picture the situation...: in the room there was me, the teacher and 12 women! I think that I finally understood what my girlfriend must be feeling when we are going to Magic tournaments. The main goal of the class was to correct the posture and increase the flexibility through exercises of posture and stretches. It's good to be there one hour without thinking about anything apart from the present and that alone is very important today. I liked that class and I will keep attending. I decided not to play the $200+ hyper-turbos until the end of the year. I learnt a lot during the past week playing them, but I didn't have the best results and my instict tells me not to play them. In the meanwhile, I will continue playing the $88/$90 and $130/$140, I want to keep getting consistent and satisfactory results. Some months ago I was playing a lot of tournaments from the Steps system at PokerStars, gaining multiple tickets for the Final Step/6. 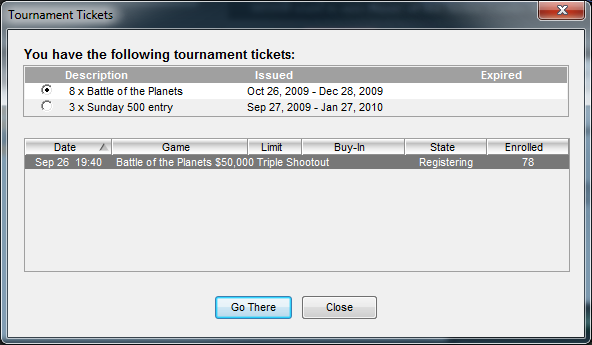 Last month I started using those tickets of the final step for the mail event of the WCOOP. Since the main event of the WCOOP is an online event, PokerStars allows to register and receive the correspondent entry in money for tournaments. I've already spent all the tickets! I'm having a downswing at the hyper-turbos, but with the quantity of hands that I play per hour, it's a thing of 2-3 days at maximum. I also need to take a day off to study the game a bit, but today it's Sunday so it can't be today. It will be sometime during next week. The plan for today will be to play a loooooooot of satellites and after those, the WCOOP-21. I would also love to play the WCOOP-22 with 30 minutes blinds, but unfortunately that won't be possible after a day full of work. Try to play these WCOOP tournaments, they are great. If you are not able to pay the entry fee, check out the satellites running all day long, there is great value there. I will try to keep you updated through facebook. See you at the tables at PokerStars. Weekend is a word that has a different meaning for different kinds of people. In my case, it usually means more work! On Saturday there are normally those VIP tournaments at PokerStars, where there are satellites with extra entries for the Poker Tours that they are sponsoring and some freerolls where PokerStars offers the prizepool. When I was building my bankroll, I was playing a lot of freerolls and only a few satellites, since playing a live tournament did not seem very appealing to me, but any boost in my bankroll was quite significant. Nowadays, my preference is playing satellites. That happens because with some rare exceptions, the potential bankroll boost is not significant enough and the live tournaments are more interesting for me. Today I will play the Supernova+ satellite for EPT London and the WCOOP-19 at 18, which costs $109 and has 10 minutes blinds. On Sunday there are the Sunday Majors (duh!) and even though I'm not playing those, there is always a lot of action at their satellites, so it ends up being another obligatory working day of the week, since it's the day with the biggest volume of work. Tomorrow I will play the WCOOP-21 ($215) that is the current substitute of the Sunday-Warmup. That one also stars at 18h. As I'm working more during the weekends, I have a looser schedule during the week. Even though I'm playing everyday, I've been playing 4-6 hours per day. If I don't feel like playing, then I don't play. It might sound selfish, but the truth is that for me at least, playing without feeling like it is EV-. That is, cause when I usually play without wanting to, I end up thinking about what I'd like to do next and not what I am doing at that particular moment. In any case, if we take 5h, 6 days per week plus 8 hours on Sundays, that's 38 hours. How many people work 38 hours per week without counting lunch breaks? I don't know many, even though I do know some. Apart from that, you all know that I spend some time keeping you updated and responding at the comments of my blog! Careful, I'm not complaining. I chose my own path and I'm very proud of fighting for this kind of liberty! I only wanted to share a bit of what I do when it comes to working schedules. Leave a comment with your playing/working/grinding schedule! I had a few comments asking about the gym. I have already subscribed to a gym in my neighbourhood and I will start next week. The ideal would be to go to some classes of the gym, but I don't know yet what my WCOOP schedule will allow me to do. I will probably skip the classes for now and do more cardio. In any case, something is better than nothing! Winner of the Summer League doubles the prize! Even after the Summer League of andrecoimbra.com finished, there were still some results worth to mention! Some days ago, the winner of the League, Nélson nezzi77 Rocha, used his $215 ticket to play a tournament at PokerStars and he won $410! 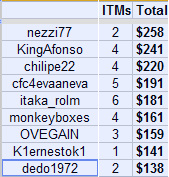 Adding those $410 to the $258 that he won during the League, Nélson managed to get a return of more than 100x his inicial investment of $5 at the Summer League of andrecoimbra.com! I don't have any news about new tournaments of the blog, but once I do, I will put a post here. In the meanwhile, there are a lot of satellites at PokerStars for the WCOOP tournaments, many with seats offered by PokerStars so benefit! Yesterday I played around 400 tournaments, including two step6 ($2100) and the HUs WCOOP ($215). The sit-n-go's went well, but in the other tournaments I didn't make it to the prizes. At the step6s I had some bad luck and I think that I played well overall. At the WCOOP I was playing but I didn't really feel like playing it and that made a difference. This morning I was the host of event #11 of the WCOOP and I almost saw a colleague of my team winning a gold bracelet. Stevesbet finished in 2nd place after dominating the final table for most of the time. Congratulations! I spent 4 hours watching the final table and I learnt something about the format called "Ante Up". For those of you who don't know it, it's a format where instead of the blinds going up, it's the antes that increase. At some point the blinds were 5-5 and the antes 15k! Sincerely, I can think of this format being the future of Poker, cause the gameplay is more complex. The impression I got from it, is that the difference is at the pre-flop plays, where it's more like the other streets and less like the traditional pre-flop. The raises were normally a 30-70% of the pot and were not superior than the pot as it happens normally in other formats. The WCOOP-13 starts at 17:00 and the WCOOP at 19:00. You can follow me on PokerStars! I am also considering to play more EPTs this year, but I haven't decided what to do yet. London is a possibility, I could pay with FPPs, but maybe I should take this month to play online. I'm saying this, cause at the end of September I will lose the SNE status and the difference in points is equivalent to a 12% decrease of rb for October. What would you do if you were me? I like cooking a lot, but lately I have been eating at the restaurant next to my building. This may sound a bit strange, but in my case, cooking is a luxury. What I make in 10 minutes playing would pay for a meal at the restaurant and I never spend less than 20-30 minutes when cooking. Do you remember the challenge that I set for myself some months ago where I tried to make $60k in 60 Days? Well, the prize of the challenge (apart from the $60k hehe) was a new mobile phone. As I needed one to put updates while at the EPT, I bought one a few days before the tournament. My choice was a Samsung Galaxy S (€400). It costs €600 if you want it to be unlocked and you don't have to sign a contract with any company, but getting a locked one for €400 was a no brainer. I'm very satisfied with the phone and if I compare it to the iPhone that I have for some years, I feel that the Samsung one is by far my favourite. I noticed that it's a lot easier to write on the phone and the Android* system is very pleasant. *I installed version 2.2 (Froyo), cause 2.1 was rebooting all the time, but with version 2.2 it's fine. Today I woke up at 7 and I took my breakfast at the balcony, watching the sun rise over the river. It was a small very inspiring moment and a great way to start my day. Afterwards, I went to get a book to read at the balcony, but the cheap chair that I bought at IKEA was not comfortable enough to read so I went to read on my bed instead. I don't know if you can call "bed" the matress that I have on the floor and that I am temporarily using, but that's what I call it. The book that I'm reading is called "The Power of Now: A Guide to Spiritual Enlightenment". I wasn't looking for spiritual guidance, but the book was recommended to me and I found in it some answers that I needed without even knowing it. It's recommended to read with your mind open! After reading a few pages I fell asleep and I only woke some hours later at the sound of the doorbell. It was the IKEA employees! They brought the couch in boxes and after placing them in the living room they asked me to sign. "Aren't you going to mount them?" I asked and they said "No sir, we don't mount the furniture". I called my girlfriend who is at the other edge of Europe and she informed me that as at IKEA they had said that the delivery would be free and directly from the factory she assumed that they would also mount the couch for free. I sign the paper, wish them good day and leave the legos in the living room for another day. I came to open some tables (of Poker :P) until lunch time and, as until now I only had a maximum of 7 running at the same time, I decided to write this diary entry. Don't worry, this will not be the new format of my blog. It's just a different post to which I am expecting reactions/feedback from whoever is following this page. I wish you all of you reading this diary a very nice day. Congratulations to nezzi77 who was the leader since the first tournament and received a $215 PokerStars ticket for winnining the League. KingAfonso that got 2nd place was supposed to get a ticket worth $55, but since there are no $55 tournaments at the WCOOP, he received a ticket of $109 to play the WCOOP at PokerStars. Chilipe22 was in 3rd place and got an $11 ticket. Congratulations to itaka_rolm who in a total of 13 tournaments, was ITM 6 times! There were several stories of people that with the $11 tickets that they received managed to get one of the prizes in the Sunday 1/4 Million. I hope that nezzi77, KingAfonso and chilipe22 will also go far with these 3 tickets from the league! This month, since there is the WCOOP, I will not organize any tournaments. Maybe I will do it next month, but for the moment I don't have anything planned. 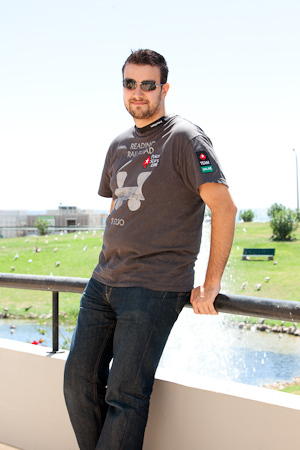 Congratulations as well to cmpjo for winning $260,289.79 at WCOOP-03. At this point where there is a general crisis, it's important to be proud of Portuguese such as cmpjo. He overcame an enormous field, made it through a 20h marathon of play and got an extraordinary prize for Portugal! Make the best of these tournaments of the WCOOP to increase your bankroll! As I recently moved to my new house and I had the EPT Vilamoura and the PT Amsterdam of Magic: The Gathering, I have very little free time and didn't put many updates in this blog. I apologize to my readers. I already talked about Vilamoura in my previous posts, so the only thing missing is Amsterdam. It was a tournament of Magic: The Gathering but I didn't make it through the first day. I did 3-2 in extended and 1-2 at the Booster draft (yep... my best format). I don't blame luck for it, because I must have made at least one missplay per game and the Pro Tour is not the place to make so many mistakes. It is difficult to conciliate mtg with my current life, so I didn't have many expectations. At PokerStars the WCOOP started two days ago, and that's the closest online version of the WSOP. I played event #1, it even started well, but I lost a bit before the bubble. In the slower structures, I start well in the beggining but after that at the point of the bubble more or less it starts going bad... I need to think about what I'm doing wrong. I'm going to play a lot of satellites for the $215 events and the events that don't start too late. As a member of PokerStars Team Online I will be hosting some final tables: #11, #36, #60. That means I'll be welcoming the players, clearing any doubts related to possible deals to split the prizes and making the experience more pleasant for them. There is a bonus at PokerStars up to $100, I already got mine yesterday! After an hour and a half I already had it unlocked, so it was basically free $100! I have 653 VPPs, so I won't make it to 1M (SNE) this month. It's not that it's impossible... but I don't think it's necessary for me to do it. I will get less points until the end of the year, since I lose the status at the end of the month, but I think that the extra stress will not compensate the difference in points of these last months. If I reach 850k VPPs until the end of the month I will be very happy, but the mail goal is to play ev+ games and optimize my hourly rate. I explained in a video for the english PokerStars blog what I was expecting for day 3. 62o where I gave a 4bet allin on the bubble to put pressure and I got a call with 99. I think the problem of the play was that the 4bet became an allin with a hand that was so small. That, because, even if he thought I had something, it's very possible that he would put me in a small pair and that would be an easy call for him. I made the play because I thought he was very uncomfortable with the 3 bet, but in the end I realized that his discomfort was because he was afraid I would call and he would have to play out of position, not because I would make an allin. I lost almost one third of my stack in that play. AA: where I raised UTG and a very tight player went allin with KK and she got four of a kind. There was nothing to do there. Bad beat. A8o: This was the last hand, I had 40Bb and the player with the 99s gave me his fifth 3bet, out of which 2 had already been folded. This was a mathematic play, very high percentage of 3bets, 40BB... I made a 4bet and paid the allin. He had AKo and I lost. You can also see the video that I did at the end of the day for the english PokerStars blog. I think that after each live tournament goes by I am stronger and that after a few I will become a more complete player. Apart from being a player with a very strong mathematical base, there are plays that I cannot explain, they just come from what I feel is the correct play. A good example of that was the play with 85o that everyone keeps asking me if it was a vbet or a bluff. As there were a lot of followers asking me what I was doing on the river, I thought a lot about this play and at some point I thought that it was more a pair transforming into a bluff. BUT, I know that if I didn't have the 5 in my hand, I wouldn't have bet what I did on the river. Therefore, if without value I don't bluff, it must have been a bet for value. A bit confusing, isn't it? 1) I was pretty sure that he was weak pre-flop and with the call to a 3bet I put him in a small pair, probably 22-88. 2) On the flop I bet and he raises. In a previous crazy play with the nuts on the turn, he bet small and only on the river where he felt that he would pay a bet, he bet stronger, so that raise on the flop seemed weak to me. 3) Turn K, I bet and he just calls. He had about 32K behind and the pot already was 64k. It gave the impression that he didn't have a great hand, but he didn't believe that I had a K either. The 7 on the river did not change anything, if he had 77 he was already ahead and I bet 15k with the intention to fold if he went allin. I also do the same when I want to pay the allin, so I have a good equilirium in that play. To resume... it was a bet for value, even though it was something I did instinctively and not after a mathematical analysis. This EPT was a great learning opportunity and I have a good progression in the tournaments. Even though I didn't make it ITM in Monte Carlo, I won $42K in the World Series and €7.2k in Vilamoura. 2/3 of this year in Main Events! I hope that you enjoyed following me during the EPT and that I creared out any doubts you might have in this last post about the EPT. I finished Day 2 of EPT Vilamoura in second place. There were a lot of ups and downs like on the day before, I lost big pots with AK and JJ, but I finished with 476.400 chips!